View Poll Results: What propulsion do you prefer? I would like to keep this topic clean so no posts about environmental costs of batteries, no bs about electricity generation costs etc, please. Only solid, practical and confirmed information. As a starter, I would like to share some information about available EVs and PHEVS on the Swiss market. The list is, more or less, sorted with increasing "range anxiety" (please correct any mistakes here). Last edited by Ace1; 25.05.2018 at 12:03. Reason: Removed odd 'CODE' tags. So the BMW i3 is the only range extender on the list, for whatever reason range extenders have never really taken off mainly I think because they don't meet the definition of a hybrid required to the grants and subsidies, a shame really as they are probably better the most HEV;s and PHEV's. In case people aren't quite sure what I'm talking about (nothing new there!!) a hybrid electric vehicle(HEV) is defined as one where both the electric motor and the IC motor can drive the wheels, plug-in HEV (PHEV) is the same as an HEV but with a bigger battery meaning you can drive longer and faster on the electric motor but you have to plug them in to fully charge the battery, most HEV's only drive on electric up to 50kph. A range extender is where only the electric motor drives the wheels and the IC charges the battery, this means that the IC only ever runs at peak efficiency so you generally get better mileage with a range extender than an HEV, besides the BMW i3, chevrolet make the volt and bolt which I believe are both range extenders. 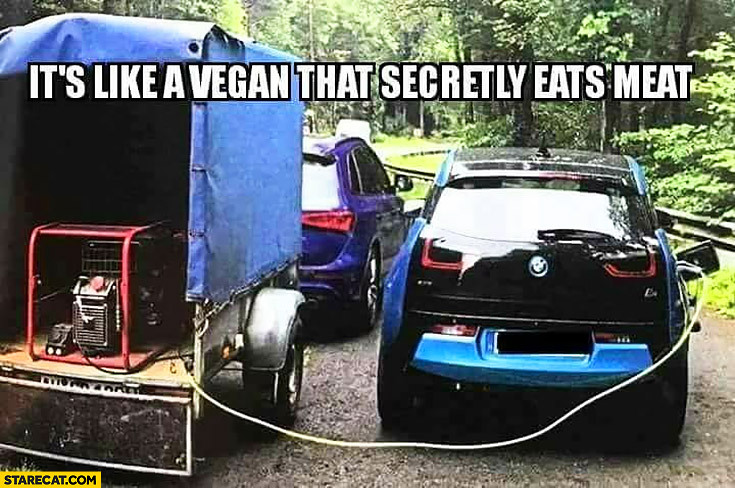 I will add that some PHEVs, like Outlander, drive through the electric motors as well, having a ICE as a generator topping up the main battery when needed. This can be treated as a range extender, although ICE can also drive the wheels directly under some circumstances (called parallel hybrid mode as opposed to series hybrid mode). By the way you forgot CNG! the Jaguar is missing in the list. Unfortunately cannot edit the main post. I propose that anyone adds their suggestions and links so this topic is alive and successively updated. the Nobe 100 looks great! 2) Larger Petrol Tank - I know this is likely due to space constraints due to the batteries required to run the electric engine, but I find the petrol tank and thus petrol range of the Outlander to be significantly below what I am used to. About 250 miles, from my experience. If this could be upped to around 400 miles I would be a happy bunny. Until the charging network across Europe becomes more mature and there is a single easy way to pay for charging, then I don't think I would ever consider a full EV as my main vehicle. As a second car, for city driving, I absolutely would however. normally I'd agree with you, but having driven the Tesla model S wouldn't take much for me to buy an all electric. This list is missing at least half the EVs available in CH including some of the more well known models like the Renault Twizy. A couple of articles to cheer you lot up. And whatever you, don't lock yourself in a Tesla in an underground car park. You may never get out! "A two-month-old baby was trapped in a Tesla car in Zurich for over an hour on Tuesday after he was accidentally locked in the vehicle by his mother. The baby boy was locked in after his mother parked the electric car in an underground garage. She and her friend got out of the vehicle and then closed the front doors. However, when they tried to remove the sleeping baby from the back seat, they realised all the doors were now locked and the car key was still inside, Zurich police said in a statement. Given the car was a Tesla, it should have been possible to open the vehicle with a wireless or mobile internet connection, but as the vehicle was in an underground car park this was not possible. According to Swiss daily Blick, the woman was also unable to get through to the Tesla support hotline on the phone. The mother of the child enlisted the help of the building caretaker and the pair spent an hour trying to break into the car using force with the help of everything from a fire extinguisher to a piece of garden furniture, but to no avail. Eventually the police were called in. Officers then tried to open the car by smashing a window with an emergency hammer but only ended up breaking the hammer. Finally, they managed to force their way in to the Tesla using a crowbar. Incredibly, the baby was still asleep having missed the whole drama and failing to wake even when the car’s alarm went off during the break in. Later on Tuesday, the woman told police the car was equipped with a form of “bulletproof glass” which she had not known about, Swiss media reported." Yet another piece of stupidity of only being able to use a mobile phone to unlock the damn thing if you don't have a spare key. Given how expensive the car is you should never be able to lock the car with the key in it. Can't do that with our Qashqai. Any suggestions on importing a PHEV from the US. I have a '13 Chevrolet Volt that I am contemplating bringing to the Basel area later this year. We are moving to Lausanne in couple of weeks with a diesel old car and we want to become a bit "greener" (I know this "greenish thing" is under discussion, but yeah..). Could the EV / PHEV users can share the current experience how the charging works, are there enough charging stations (we will not have opportunity to charge at home), approximate prices, ect...? Please help us to understand what issues can we face, as we really don`t want diesel.. Maybe hybrid then is better? Amazon is investing 700M USD in Rivian. Seems to get pretty serious.